steal a priceless statuette in order to ransom him. Filming Dates: October 25-27, 1966. Original Air Date: December 26, 1966. The Monkees audition to perform at a ball for the wealthy Madame Rantha along with a group of gypsies, Maria and her four sons Marco, Rocco, Zeppo and Kiko. When the Mme. Rantha chooses The Monkees over the gypsies they are angered since they hoped to steal Rantha�s Maltese Vulture, a jewel-encrusted statuette. 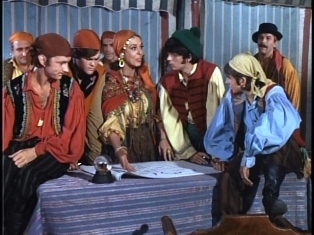 However, Maria invites the band to their gypsy camp to prove there's no hard feelings, but The Monkees are worried as heck. The Monkees reluctantly arrive at the camp and soon The Gypsies have them dressed in gypsy outfits and gives them each good luck charms.� Afterwards, the gypsies take them around to entertain them but unbeknownst to them, Maria tells her plans to Marco to capture The Monkees through all kind of means in order to use them to help them steal the Maltese vulture.� So Rocco shows Micky the fine arts of predicting the future via tealeaves, whereupon Micky drinks a mug of tea spiked with a potion which renders him unconscious;� Marco shows David how to fight with a switchblade and winds up using him for target practice;� Kiko teaches Peter a lesson in gypsy dancing with a gypsy woman until he�s all wrapped up lace; Kiko teaches Peter a lesson in gypsy dancing and Zeppo instructs Michael on phrenology (i.e., the reading of bumps on one's head), and before he is finished, he knocks him out with a mallet.� After they are all bound hand and foot, Maria threatens them to either help them steal The Maltese Vulture or be tortured by red-hot pokers, giving them 5 minutes to decide.� The guys, facing the fear of torture, imagine The Gypsies putting David to the rack which makes him ten feet tall!� Back to reality Maria gives the one last chance to reconsider and to orders Marco use a poker on them when The Monkees finally consent to steal The Vulture for Maria.� However, The Gypsies decide to hold Peter as a hostage to make sure they deliver the vulture by midnight and sends Marco in his place. After their performance at the party, The Monkees try unsuccessfully to warn Mme. Rantha.� Then Micky reveals the gypsies dastardly plans to one of the guest but he is Yugoslavian and doesn't understand English.� Michael and David throw a message inside a bottle out of the window but end up getting two cents deposit.� Marco then sends them to dispose of the two guards standing outside the bedroom where the vulture is hidden.� Michael and Micky try create a diversion for the guards (failing with a phony robbery, a phony attack, but to no avail since the stubborn guards won�t leave their post; finally, Michael and Micky stage a phony arson by lighting two matches but when they toss their matches onto the floor, the guards finally advance on them for littering!� David manages to sneak into the room and uses an arsenal of tools, which consists of explosive devices, clamps, stethoscope, sledgehammer and a rabbit!� He takes dynamite to the safe in an attempt to blow it up but ends up detonating the lamp instead. Then using the stethoscope, he tries use the combination only to hear the tune of �Last Train To Clarksville,�.�David quickly hides when Mme. Rantha enters to room with a friend and opens the safe which was unlocked all along to show off the jewel-encrusted Maltese Vulture. After The Maltese Vulture is returned to Mme. Rantha and the cops arrive, Maria vows that she and her boys will reform since the Monkees helped them realize they can make a faster buck in show business with little talent and bids them a farewell.� But after the gypsies are taken away, Michael and David discover their watches are missing, Micky discovers his wallet is missing and they all discover that Peter is missing leading them in pursuit of the gypsies! �The Son Of A Gypsy� features brief snippets of �Let�s Dance On� and �Last Train To Clarksville,� both Boyce-Hart compositions. This episode also has the distinction of featuring 2 of The Monkees' #1 hits: �Last Train To Clarksville� and �I�m A Believer�. �The Son Of A Gypsy� �s former ending involved Peter starting in pursuit of the gypsies for the return of The Monkees� wallets and watches, but is stopped in his tracks upon realizing his trousers are stolen! Less than week after this episode aired on NBC, The Monkees TV series premiered in England on BBC1 and BBC2 with the airing of the premiere episode, �The Royal Flush�. Bob Rafelson previously discussed the possibility of the show's being shown in England to David Jones in the closing interview segment of Episode No. 6, �The Success Story�. As this episode made its first-run telecast over NBC, The Monkees played their first gig on their 12-city U.S. tour at The Denver Coliseum in Colorado. Director Frawley cameoes as a Yugoslavic dilletante at the party; it was his first appearance in front of the camera on The Monkees as an extra. He also appears in Episode No. 40 "Monkees Marooned", No. 54, "The Monkees In Paris" (a.k.a. "The Paris Show"), and No. 57, "The Monkees Blow Their Minds". The cannon used in this segment towards the end of the �I�m A Believer� romp (which fires a small cannonball into Marco's mouth) is reused in Episode No. 33, "It's A Nice Place To Visit..." (during the �What Am I Doing Hangin' Round?� romp sequence), and The Monkees' 1968 feature film HEAD (in the ghost town scene where David uses it to liquidate Lord Hign 'n' Low [Timothy Carey] and his posse). Stu Phillips' composed and conducted background music for "The Son Of A Gypsy" was recorded on Friday, December 2, 1966 from 4:30-7:30 p.m.
Micky doesn't fall down like Marco predicts. When David slips on gloves while trying to crack the safe, the clamps for the detonation device are not attached to the safe; when David is forced to hide, they are attached; but when Madame Rantha enters the room, they are unattached again. The Maltese Vulture is an obvious lampoon of The Maltese Falcon, subject of the 1930 Dashiell Hammett detective novel and the Oscar-nominated 1941 Warner Bros. Picture directed by John Huston and starring Humphrey Bogart. The running gag featuring David being used as a knifethrowing target was reconstituted in the teaser scenes of Episode No. 22, �The Monkees At The Circus�, perpetrated by The Amazing Victor (Richard Devon). The art of fortune-telling through tealeaf reading is reused here; the first time is in the previous segment, �Too Many Girls� (a.k.a. "Davy And Fern"). A scene in the teaser sequence of �The Son Of A Gypsy� finds Maria (Jeanne Arnold) restraining Marco (Vincent Beck) from tearing The Monkees apart for taking the job at Madame Rantha's party; she merely says, "Marco's sullen moods only last 3 years!" The subject of prolonged sullen moods resurfaces in Episode No. 22, �The Monkees At The Circus�: in it, Victor (Richard Devon), according to Susan (Donna Baccala), "has these sullen periods"; Micky jokingly retorts, "What, do they last 2 or 3 years?" In the scene where Micky and Michael try to distract the guards with their robbery act, Michael quips, "Who is this masked man, anyway? ", which is a widely popular question oft-asked of The Lone Ranger. Other Monkee references to the George W. Trendle-Fran Striker-created masked hero can be found in Episode No. 7, �The Monkees In A Ghost Town�, and No. 45, "The Monkees In Texas". In various scenes of "The Son Of A Gypsy," The Monkees' 8-button shirts appear in a dazzling, patriotic array of colors. In the teaser, their shirts are red. In the scene where they play their gig (with Marco filling in for Peter) in Madame Rantha's party, they wear blue shirts. And in clips of the musical number wherein The Monkees perform �I�m A Believer� (from the previous episode, �Too Many Girls� [a.k.a. "Davy And Fern"]) which are stitched into this episode's chase climax, their shirts are white! The gag where David tries to blow up the safe but instead blows up a table instead was re-used in Episode No. 25, �Alias Micky Dolenz�, where Michael and Peter try to blow up the fireplace but instead blow up a table. A similar gag is employed in No. 11, �Monkees A La Carte�, in the scene where The Monkees attempt to blow up Fuselli (Harvey Lembeck)'s safe, but they detonate his desk instead. This is one of two occurrences where a Monkee dislikes the way a certain character acts---and it's in reference to that character's behavior, not his acting ability! Another is in Episode No. 26, �Monkee Chow Mein�. "[When I think of gypsies] I think of Ethel Merman! ", a comment made by Peter, is a reference to Ethel Merman's role as Gypsy Rose Lee in a 1959 version of the Broadway musical Gypsy. Interestingly, after �I�m A Believer� made its final appearance here in "The Son Of A Gypsy", it begat its 7-week run as the #1 song on Billboard in the weekend following this episode's airing on NBC (New Year's Eve, 1966). The scene in the �I�m A Believer� romp which finds The Monkees and The Gypsies partaking in a mock football game foreshadowed the sporting event which preempted The Monkees TV show the week following this episode's telecast: the January 2, 1967 broadcast of The Rose Bowl (USC Versus Purdue). And the war sequence in the 1968 movie HEAD finds Private One (Ray Nitschke) scrimmaging with Corporal Peter. Historical Note: The 1967 Rose Bowl had a distinction of being the very first program to preempt The Monkees television series on NBC. When Marco gives Michael a boar's tooth as a good luck charm and Michael finds on it "a little bitty cavity! ", he quips that "this group had 20% fewer cavities!" It is in reference to Procter & Gamble's Crest Toothpaste; ironically, Crest would be one of numerous interim sponsors for The Monkees TV series on NBC in summer 1968, following the departures of main sponsors Kellogg's� and Yardley Of London�. Gene Dynarski (Kiko) pops up again on this series as Toto, The Dragonman's chief Red Chinese henchman in Episode No. 26, "Monkee Chow Mein." Star Trek devotees will recognize Dynarski in his role as Ben Childress in "Mudd's Women" (#6149-04, 10-13-66; which also featured Monkee guest actor Jon Kowal as Herm Gossett) and Krodak in "The Mark Of Gideon" (#60043-72, 1-7-69) of the 1966-69 NBC-TV classic series and as Commander Quinteros in a February 14, 1988 episode of The Next Generation entitled (or numbered!) �11001001�. On the exact same night Vincent Beck appeared as Marco in the episode "The Son Of A Gypsy", he was also appearing on ABC's The Iron Horse, in the episode "Hellcat" (along with another Monkee guest, Arlene Martel). Doubly ironic, both episodes were the sixteenth in their respective runs!! This was Beck's first clean-cut appearance on The Monkees; in his first appearance, in Episode No. 1, �The Royal Flush�, he was mustachioed. Jeanne Arnold (Maria) played bit parts in such series as Please Don't Eat The Daisies (NBC, 1965-67) and Bewitched (ABC, 1964-72, in a February 12, 1972 "Tabitha's First Day Of School" episode of the show with Monkee guest alum Nita Talbot ["The Monkees Watch Their Feet"]); she was also Ellen Mason on the CBS Daytime drama The Guiding Light from 1969 to 1973. Among her many film roles was that of the malevolent Grace Munster in the 1966 Universal Picture Munster, Go Home, which was spawned from the 1964-66 CBS sitcom The Munsters, one of whose stars, Butch Patrick (Eddie), will appear in Monkees episode No. 47, "The Monkees Christmas Show" (the movie also featured Monkee guest alum Cliff Norton ["The Picture Frame"], Diana Chesney [�The Chaperone�], and Ben Wright [�The Success Story�]). Ironically, Victor Tayback, who plays Rocco in this episode, would later on play another character named Rocco in the November 6, 1970 episode of The Partridge Family (ABC, 1970-74), "Danny And The Mob"! Tayback also appeared in the Partridge episodes "Guess Who's Coming To Drive" (12/10/71) and "Forgive Us Our Debts" (3/2/73). The late Ralph Roberts has an unbilled role as a security guard in this episode. He and �The Son Of A Gypsy� co-guest Vic Tayback later reappeared together in a March 25, 1967 episode of Gunsmoke (CBS, 1955-75), "Ladies From St. Louis" (#1615-0228), which also featured Kelly Jean Peters (�Too Many Girls� [a.k.a. "Davy And Fern"]) and Venita Wolf ("I Was A 99-lb. Weakling" [a.k.a. "Physical Culture"]).